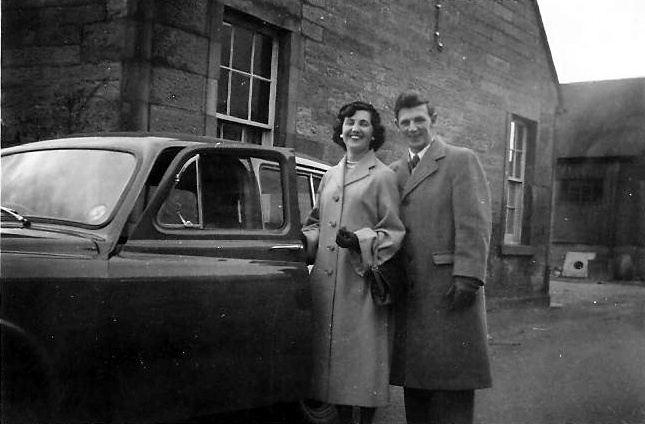 This is a picture of Gordon Andrews and his wife Dorothy Mackenzie, outside Ness Cottage in Clyde Street, around 1955. Is this the Gordon Andrews who became a successful football pro? - played for Derby County and in the early 60s managed QPR? Thanks for putting me straight on this Neil. I guess I had not remembered there were 2 successful Andrews footballers. I live very near QPR and have been a fan since the '60s. I remember trying to get England v Scotland tickets (with no luck!) from your Uncle Jimmy when he was at the club. I spoke to my sister Audrey last night and she told me she is now in touch with your Aunt Eileen thanks to this site. Please give Jimmy my good wishes when you can. Billy, my father, Gordon, played for a reasonably successful Inverness Clachnacuddin team in the early '50s as a right winger. Gordon and Dorothy still live in Inverness and visit Invergordon regularly. The photo shows them on their return from honeymoon in early April 1955. His older brother Jimmy, played for Dundee before being transferred to West Ham (where he played over 100 games) for around £4,500 about 1950. He then went on to be coach/assistant manager at the likes of QPR and Chelsea before becoming Manager at Cardiff City from '74 to '78. Still living in Cardiff area.